There were other days, I meant to write about them here but never got around to it. They are on Rusty’s blog, here and here. Today it was the big bunch from over west. We loaded up the four wheelers and took pickups and semis and went over bright and early to get them. Our four wheeler was well loaded with the four of us and Daisy. 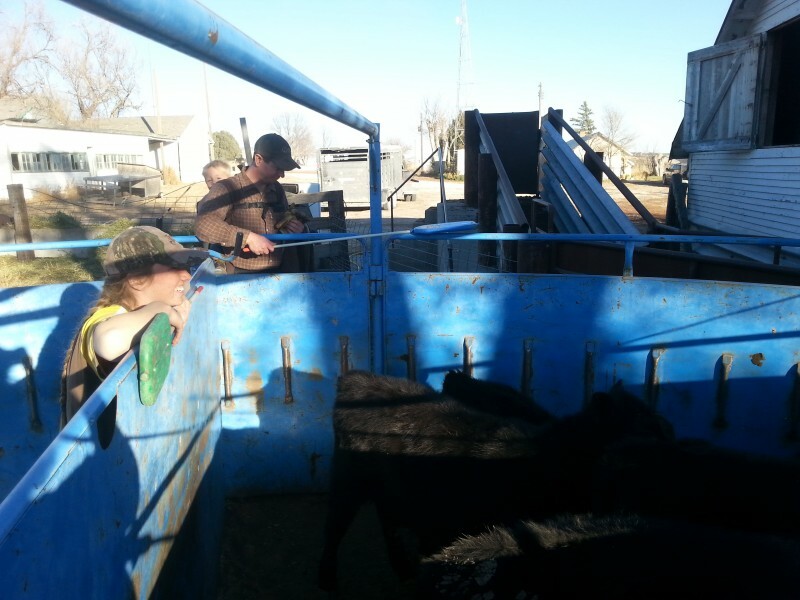 The cattle came in pretty easy, only a couple minor mishaps. Tanna left hunting early, it was opening day morning, and came to help. She and I, and a few children, went back to the house with the first semi load. 8 was exhausted and went in for a nap right away. The Goblin child spied the cousins just arrived and ran to join them. 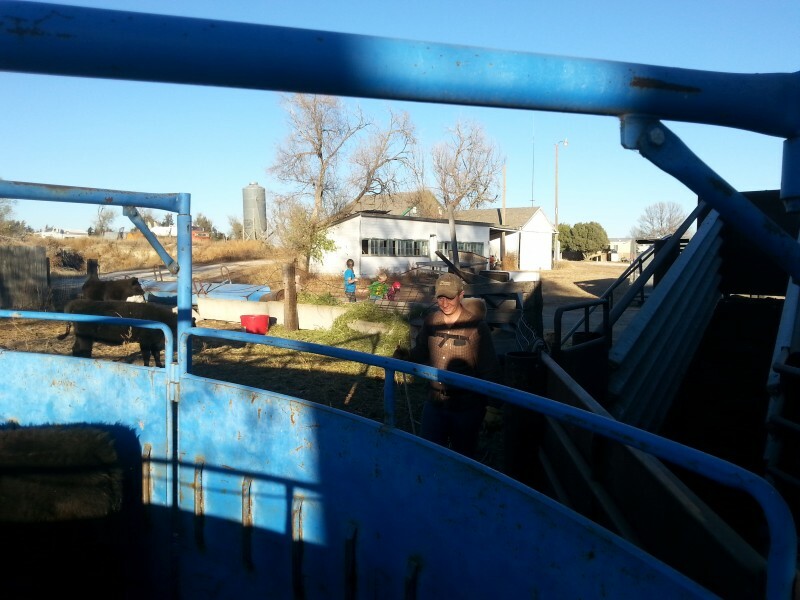 After unloading Tanna and I started sorting cattle. Tanna did the sorting, and a great job of it, while I ran the gate. Before the first semi was hardly gone the second one arrived and the two horse trailers shortly after that. We were kept on our toes. 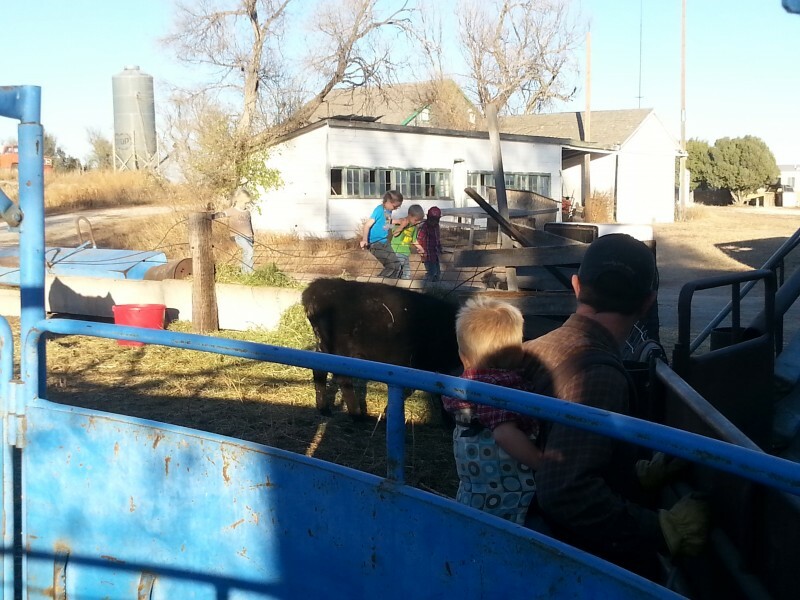 To make it slightly more complicated in one of the first loads was a crazed steer of undetermined ownership. He charged past us a few times and jumped over our most used gate. The gate was no longer able to close and latch after his loving attentions. 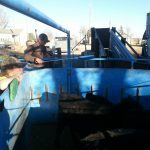 We were able to get him sorted into the pen with the calves before my semi driving husband returned with his second load. Although it tried the steer didn’t quite succeed in killing us. Six semi loads and four trailerfulls later we were nearly dead on our feet. After the last loads were hauled my hard working husband stuck around to help finish the sorting while everyone else went to hang out at the house. The extra person was appreciated and made the work quite a bit easier. Especially with our most used gate out of commission. I had looked up and seen, much to my surprise, The Goblin Child and Ava climbing out of a semi on one of the last loads. 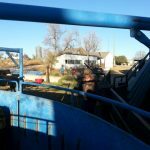 Everyone had decided to go watch them load the cattle and at some point she had ended up over there. And I thought I knew where she was, I am such an awesome mother. After a quick lunch break we all went back to work the calves we had sorted. The three of us, Tanna, husband and I, had made such a good sorting team we decided to stick together and push the calves into the shed. Soon 8 was returned to us and his loving father wore him for the rest of the workings. Little did we know that was going to be the safest spot for him. The calves were going in pretty nice, for the most part. 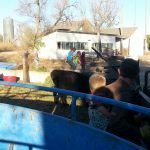 We had all talked about the abundance of large, yearling types in with the calves as well as the brand new baby calves, all of which needed sorted off. We discussed which pen they were going into and how one of the yearlings was crazy. We watched carefully for the crazy one with every sort we made and finally towards the end we got all the yearlings in one bunch. The crazy one went in early and we shouted a warning into the barn with him as he went in. He went through, but no yearlings appeared in the agreed upon pen. The rest of the yearlings went in but still nothing was put in the separate pen. Suddenly in the barn there were screams and general commotion, calves billowed back out the chute. In the barn the crazy yearling, all the yearlings, had been run through and given the same shots as the calves then, with our warnings well ignored, turned into a tiny pen right up against the door inside of which they were working. He had decided to come back in. Through the middle of the children hanging out watching the adults work. God is good though, he passed them all by, went through the barn and out the open gates and door on the other side. All lives were spared, but it was way to close a call for my taste. Apparently our children wont be able to get that close any more. The yearling was long gone. A few people grabbed four wheelers and took off after him but he was long gone and on the fight when they caught up. When they tried to turn him he took the four wheelers and how much effort is it really worth putting in for a yearling of undetermined ownership? Maybe he ran back to where ever he came from in the first place. The Goblin Child had lead the other, older girls into her room to play where it was “safe”, smart girl. 8 and I joined them and we waited for the others. The day was done, the work complete. Calves vaccinated and weaned, cows in the pen next to them so they can see and comfort each other if not be together. Now we attempt to wash the dirt off that worked it’s way into every crack and crevasse on an incredibly dusty, dirty day. Oh, while we were pushing calves into the barn a herd of dogs showed up. Quite randomly and out of the blue, three of them were there in the yard. One of them was trying to kill a chicken. My protective husband chased it off and away from the poor chicken, we haven’t seen the chicken since but have hopes that it is still alive and out there somewhere. Two of the three dogs were caught and stowed in a trailer, the third was run down the drive as hard and fast as a four wheeler could run him. Neighbors were called until the owner was found and came to get them. It was a strange and, hopefully continues to be, rare occurrence.